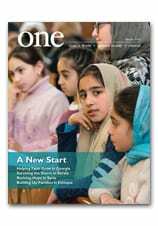 In the current edition of ONE, Michele Chabin reports on something Found in Translation: the promise of young Christian refugees learning Hebrew in Israel. But that’s just the beginning. Here, she adds some additional thoughts. You can walk past a building a dozen times, but until you knock on the door and step inside you have no idea what you’ve been missing. That’s exactly how I felt when CNEWA asked me to write a feature about the St. Rachel Day Care Center in Jerusalem, which is housed in a prefabricated building on the grounds of a monastery I hadn’t known existed. The Rachel Center, which receives vital funding from CNEWA, cares for the children of some of Israel’s African and Asian migrant workers and asylum-seekers. Were it not for the center, the parents — including several single mothers — would be unable to work and feed their families. Touring the center, from the babies’ nursery to the playrooms where the older children congregate after school, I was struck by three things: the cleanliness; the high ratio of adults to children; and the fact that everyone, from the sisters to the Catholic lay people, were speaking to the children in Hebrew, the predominant language of Israel. Why Hebrew? Unless they learn Hebrew, these children — most of them born in Israel — will struggle in school and be unable to integrate into the country they call home. The fact that — except for the ethnic makeup of the children and the Christian atmosphere — St. Rachel is indistinguishable from any other top-notch Israeli child care center is remarkable given the horrible conditions most migrant/asylum-seeker’s children are forced to endure in makeshift childcare centers that receive neither Israeli government funding nor inspections. Several years ago, I visited one such center in south Tel Aviv, where most Israel-based migrants and asylum seekers live. It left such a sad impression on me that I remember every detail to this day. There were dozens of infants and toddlers in the two-room preschool but only three caregivers for up to 80 children. They didn’t have the time to change all of the children’s dirty diapers or clean them if they were sick. Bottles were propped up on towels because there weren’t enough adults to hold all the babies while they ate. The center had almost no toys, so the TV on the wall was the only thing that kept the children occupied — that, and an occasional group of volunteers who took the older children out to a nearby playground. At St. Rachel the rooms are immaculate and there are so many wonderful toys and building blocks to play with. There is a library full of beautiful children’s books, plus dance classes and a safe playground with a soft floor to protect against injuries. There is healthy food, music and singing and laughter, all in a Christian setting. Read more in the June 2017 edition of ONE. The migration of Christians in the Middle East over the last several years — owing to the war in Syria, the rise of ISIS, and ongoing political upheaval in the region — has had a profound impact on the region. The cultures and countries that are the very cradle of Christianity are seeing the faith disbursed and displaced. But hard and reliable statistics on this movement of peoples have been elusive — until now. Drawing on diverse statistics and resources, CNEWA has compiled what amounts to a definitive snapshot of Christianity in the region today. It is available as a multimedia presentation at this link. We encourage you to visit the site and see for yourself how recent events have affected parts of CNEWA’s world — and, indeed, will continue to affect all of us who care about our brothers and sisters in the Middle East. Shilpa Joy’s job as a therapist requires her to deal with many people every day, something she would never have imagined when she arrived at the sisters’ doorstep, a child escaping a violent home plagued by alcoholism. “At the children’s home, I learned to adapt, live and work with many different kinds of personalities. I came to understand other people and see how the many other children are. Living with these different types of people helped me to get out of my childhood introversion,” she says. Recently, Ms. Joy started a new job at the Home of Peace — a center dedicated to children with disabilities, run by the Daughters of Our Lady of Mercy — a stone’s throw away from her home with the Sisters of the Sacred Heart. Indeed, the sisters have welcomed her to live with them once more, temporarily, as she searches for an apartment. At work in the Home of Peace, Ms. Joy makes use of all her professional skills, providing physical and speech therapy. She also has to adapt constantly to the very specific and sometimes acute needs of the children at the home. In the home’s physical therapy room, a sort of gym adapted to special needs, one boy works on his balance by sitting on a large ball. Another boy, who wears a prosthetic lower leg, practices walking on the treadmill. At a nearby table, Ms. Joy performs stretches and exercises with another boy who suffers from cerebral palsy. After work, she goes back to her accommodations with the sisters. There, she serves as a sort of role model and counselor to the children in the home. She helps the girls with their homework and she urges them to strive for great things. Read more about The Secret of Their Success in the June 2017 edition of ONE. In the video above, Iraqi forces are seen declaring victory over ISIS in Mosul. More than 130,000 Christians in the Nineveh Plain of Iraq fled to what amounted to a “foreign” land in neighboring Iraqi Kurdistan. They became refugees in settlement camps. What has happened to those who settled in these camps and what does the future hold for the displaced? Having visited Kurdistan recently, I have seen firsthand some of the liberated towns and cities previously held by ISIS. I can personally attest to the devastation of some towns and villages, the desecration of holy places and objects, the total theft of or destruction of all personal property. But the basic structures remain. However, I want to share with you an ongoing dilemma confronting Christians and other displaced people. It is the emotion-filled question: Should I return to my “liberated” town, village or city?